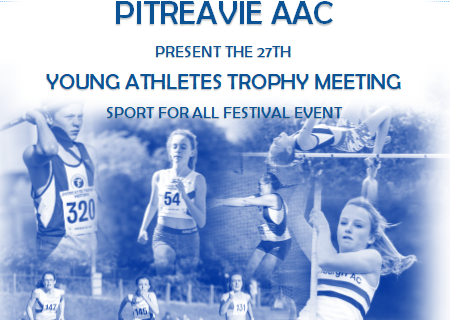 Pitreavie Young Athletes' Trophy Meeting Sunday 2nd September 2018. Pitreavie Athletics Centre 10am - 5pm (Event timetable will be distributed to entrants 1 week prior to the event) This event is now in its 27th year and is one of the biggest of its kind in Scotland, providing competition in a large programme of track and field events for U11s up to U17s. The event is always held in September at Pitreavie Stadium and is run by PAAC. Awards are presented to the first three places in each event.